Latham is a village located in Albany county. It lies within the town of Colonie and has a population of roughly 20,000. While Latham is first and foremost known for sporting some of Colonie’s most beautiful homes, it has also made a name for itself in fine dining and cuisine. Innovo Kitchen is one such fine dining establishment. This popular restaurant features snacks, appetizers, a bloody mary bar, brunch and happy hour along with a full menu of lunches and dinners. Add to that in the same plaza the Gallery 7 Market place and you’ll find something for everyone to enjoy! We highly recommend all of these fine restaurants. Give Beff’s PWB a try if Pizza and Wings are your thing. A short drive into downtown Colonie reveals even more activities and dining to be had. (See guide on Colonie for details.) Furthermore, with the state capital of Albany only roughly 15 minutes away, Latham puts the big city at your fingertips. Whether you are craving a shopping spree at Colonie Center or just needing a day out to enjoy some of the city’s parks, you can rest easy knowing it is all a short car drive away. 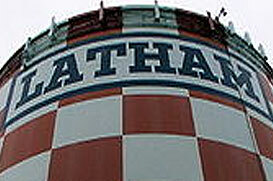 Latham is served by the North Colonie Central Schools public school district. The district is made up of six elementary schools, a junior high school, and one high school. In 2012, it was ranked the number 4 school district in the Capital District by The Business Review. Latham is a community perfect for an individual or family looking to enjoy everything the Capital District has to offer but also live in a haven that separates them from the sometimes busy atmosphere of New York’s capital. It’s a community that offers a resident of Colonie the best of both worlds: a nearby city for adventure, but a small, charming community to call home.